Have you ever wished you could see where heat was escaping from your house? This was the quest that spurred the work of Geoffrey Hay, a geography professor at the University of Calgary. After seven years of research, he founded MyHEAT, a Calgary company that helps homeowners visualize the location and amount of heat loss from their homes. To accomplish this, a high-precision thermal sensor is attached to an airplane, which flies overhead. MyHEAT’s resulting map of rooftop heat loss is created by combining raw data from the sensor with other mapping data sets and some machine learning. There are only a few other companies in the world attempting similar heat mapping. 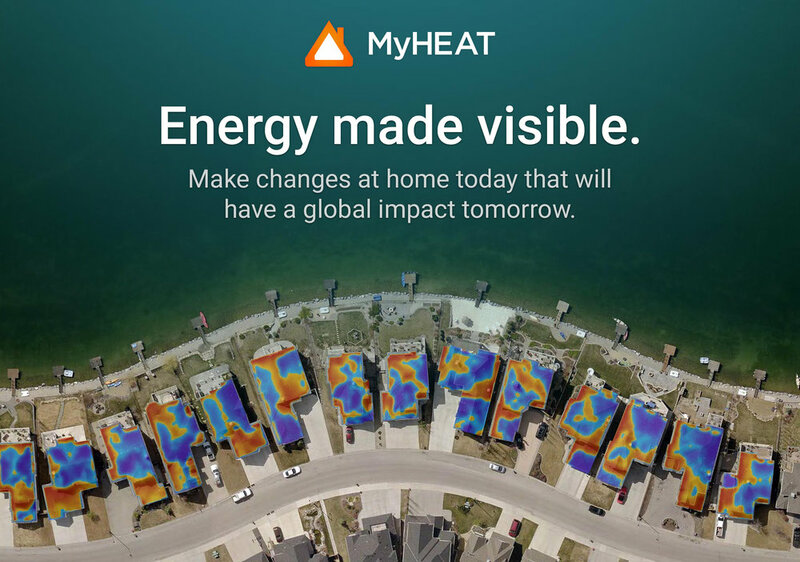 Some of its competitors use a 360-degree sensor attached to a car (similar to Google Street View cameras), but MyHEAT’s advantage is the speed at which heat loss data can be collected. By attaching the sensor to an airplane, the entire city of Calgary could be mapped in two nights. MyHEAT is more than just a heat mapping technology. The company’s vision is to help homeowners understand how their home’s heat loss compares to others in their community. By creating heat loss ratings, MyHEAT builds on the power of thermal imaging as a behavioural nudge tool. This thinking is getting some major recognition; with MyHEAT, Hay beat out 400 other contestants to win the grand prize at MIT’s 2013 Climate CoLab Conference. MyHEAT CEO Darren Jones said these heat maps can be a quick and inexpensive first step for engaging homeowners. “Homeowners are fives times more likely to take action after seeing their heat map,” said Jones. The heat loss maps and ratings are an indicator, he said, and should be used in conjunction with knowledge of the home. Insufficient insulation and poor sealing are two common culprits of heat loss that MyHEAT can often pinpoint. These findings can be the starting point for an energy audit. So far, there has been a lot of interest from homeowners; 150,000 Albertans have viewed their home’s rooftop map, and 300,000 homes in Alberta have been clicked on. MyHEAT has mapped several cities in Alberta, Ontario and British Columbia, but the goal is to eventually map all of Canada. The company just finalized its first deal with a customer in the U.S. and is excited to continue building its global customer base. The company also wants to continue building the product and offer tools that is invaluable in helping Canadians find resources to improve the energy efficiency of their home. Daygan Fowler, MyHEAT’s program manager of energy efficiency, said many incentive programs are available to help homeowners. Her goal is to use MyHEAT to bring more awareness to these, and develop tools and resources to help answer homeowner questions. Although often invisible, MyHEAT is improving energy efficiency one rooftop at a time. You can learn more about MyHEAT here. Check out the Resources page for more information on how to undertake your own clean tech and energy efficiency projects. Christina Pidlaski was determined to carve out a career in energy sustainability. After working in California for 10 years, she returned to Alberta to be part of the clean energy transition. “I never really knew how I could play my part,” said Pidlaski. She decided to pursue an MBA specializing in Energy Management and Sustainability at the University of Calgary. One of her courses involved a consulting project and she chose to work with the Canadian Coalition for Green Finance, which exposed her to green investment and research. A big part of her work was to communicate her research and make them accessible to investors and industry. Nearing graduation, she found a job posting at Ecofitt, a Canadian energy efficiency company which began with a small staff of 15 in Calgary. Working closely with consumers on energy efficiency seemed too good to be true to her, but within a week she was working as the company’s Program Coordinator. Ecofitt runs energy conservation programs across Canada and works with provincial and municipal governments to develop regional programs. They also manufacture water and electricity-saving products, including light bulbs, which they use for direct install and kit programs. Ecofitt’s first Alberta program working with Energy Efficiency Alberta’s Residential No Charge Energy Savings Program (RNCESP), involved efficient upgrades for both rural and urban houses, apartments, and condos, where teams installed LED bulbs, faucet aerators, low-flow showerheads, power bars and smart thermostats. As Ecofitt expanded, Pidlaski was promoted to Regional Program Coordinator, then again to Operations Manager. At the peak of the RNCESP, she had 16 field coordinators and nearly 400 technicians working on her team, some who originally worked in oil and gas, but whose skills were easily transferable to energy efficiency. As the program nears completion, the team size has become more manageable, but the logistical challenges still keep her busy. Pidlaski said the response to the program has been extremely positive. When Energy Efficiency Alberta (EEA) launched the RNCESP, which is administered by Ecofitt, Albertans registered 153,000 homes. As this one-time program nears completion, Ecofitt has delivered energy efficient upgrades to 118,000 of these homes and installed 28,000 smart thermostats. Ecofitt has now been awarded the EEA contract for the Affordable Housing Energy Solutions Program, which will launch in September. This will reach 25,000 Albertans in vulnerable sectors using the same core team that carried Ecofitt through the RNCESP. The gap from net-zero houses to large-scale net-zero commercial buildings has been bridged. The Mosaic Centre for Conscious Community and Commerce in Edmonton is the first commercial net-zero office building in Alberta. In a net-zero building the amount of energy used is equal to the amount of renewable energy generated on-site on an annual basis, allowing the Mosaic Centre to use 65% less energy than a conventional commercial building. What was once just a dream of co-owners Dennis Cuku and Christy Benoit has become reality. “We said it was going to be beautiful. Check. Sustainable. Check. And affordable. Check,” says Benoit. This 30,000-square-foot building cost $10.5 million dollars. It’s bright and roomy with beautiful exposed wood beams, feature stairs and a three-storey living wall in the foyer. It has large south facing windows, thermally massive concrete floors and as low an electricity demand as they could get away with. They reduced that demand by getting rid of as many overhead light fixtures as they could. Instead, the workers get copious amounts of natural light and use task lighting when necessary. There is much more energy demand per square metre in a bigger, commercial building than a net-zero home. The owners put together a team led by Vedran Skopac of Manasc Isaac Architects that used lean processes and integrated project delivery to build this first-of-its-kind building. Typically, tradespeople just show up, do their job and leave it to the next crew to finish their part. With the Mosaic Centre crews collaborate to help eliminate the wasted time and materials that happens on a typical build. As a result, there were no change orders during the project, which is almost unheard of in a modern construction project. Mosaic’s heating and cooling system is a fully electric ground source heat pump system. The parking lot on the north side of the building is a geothermal field with 32, 70-metre deep boreholes. With all of the south-facing glass and concrete floors, the building actually has a much larger cooling demand than a typical Edmonton office building. If the sun is shining brightly the building even has to run its cooling system in February. Unusually for a commercial building, the windows can be opened. These help regulate the temperature in the summer and gives workers a measure of control over their environment. The building achieved LEED platinum certification, the highest possible level of recognition for environmental stewardship on a construction project. “Sustainable and beautiful can co-exist. When you put affordability in there that’s where the real challenge occurs. But this is, I think, a living example of how the three can co-exist,” says Benoit. Due to high savings on energy costs, the net return on investment, over 5 years, is the same as that of a conventional building. They want to inspire other builders to follow in their footsteps and to make commercial buildings closer to net-zero. To that end the engineering and research reports on the building are publicly available. If you are a builder and you want to make sure your next commercial building is closer to net-zero, the recipe is out there. An Earthship is a long skinny bungalow with an earth berm enveloping the back and sides and a greenhouse on the front. The back and side retaining walls are made of tires sledgehammered full of dirt. Non-load bearing interior walls are made of aluminum cans sandwiched into a honeycomb of concrete. Here’s the story of how a family built an Earthship in southern Alberta. After first reading about them in The Geography of Hope by Chris Turner, Duncan Kinney passed the book along to his dad Glen. He was intrigued so they volunteered on a build near Wheatland, Wyoming. Glen even volunteered on another build in Hundred Mile House in central B.C. the next year. "It was invaluable seeing one built first-hand and meeting other volunteers and the crew"
A couple years later after everything was in place Duncan’s parents went down to Taos, New Mexico to check out finished Earthships first-hand. Suitably convinced they came back with plans for a three-bedroom, two-bathroom Global Model with a couple of modifications. Michael Reynolds is the father of the Earthship movement. An architect by training and rabble-rouser by nature he was dissatisfied with standard home design and started building sustainable houses on the mesa using garbage. He used bottles, cans and tires alongside natural and conventional building materials. For the past 20 years Reynolds has been perfecting the design. The design revolves around six core concepts: on-site electricity production and wastewater treatment, using rainwater into drinking water, passive heating and cooling, food production and using readily available materials. It has four walls, a roof, flush toilets and satellite TV just like any other North American home. It generates electricity on-site with solar panels and batteries. Drinking water is caught by the metal roof and collected in four cisterns capable of storing 5,800 gallons of water. That water is treated and filtered to make it ready to drink. Greywater from the showers and bathroom sinks is used to water the greenhouse. That greywater is pumped back into the house and used to flush the toilets. Simple earth tubes and ceiling vents keep the house cool in the summer. Passive solar design, thermal mass, lots of insulation and sunlight keep the house warm in the winter. The Kinneys hired the Earthship crew and Michael Reynolds to build the house in Lethbridge. With them came another 30-35 volunteers who camped on-site. Eight hundred tires were pounded and stacked by the end of the fourth day. About 12,000 cans were used for interior walls, for the bond beam that sits on top of the tires and to help fill in and pack out the tires to get them to a level surface. What began as a radical alternative in the New Mexico desert 30 years ago has evolved into an inspiring and surprisingly simple home. And the lessons learned from Earthships can be seen today in increasingly popular net-zero homes. What if we could build suburbs that preserved the natural landscape, featured super energy efficient homes, built a sense of community — and had no vinyl siding? The neighborhood of Echohaven in northwest Calgary is doing it. A typical suburban development scrapes the site bare and parcels it into lots. At the end, a park might be created or a pond or natural space rebuilt. Echohaven, on the other hand, preserved 60 per cent of its natural spaces from the beginning. The development preserved its unique knob-and-kettle foothill topography with ponds, creeks, forests and wildlife by parceling off 24 small lots with big natural spaces owned by the neighbourhood condo association. Instead of a big backyard, kids get to play in a neighbourhood creek or a forest. And the landscape has a purpose. “Typically, there’d be storm sewers that carry all the runoff from the site down to the Bow River through a series of pipes. We’re reducing the amount of infrastructure by retaining all the storm water management on-site. They feed the ponds, the storm water contributes to the ongoing viability and health of the ecosystem here,” says Dave Spencer, one of the founders of the Echohaven project. The homes also collect rainwater for use in toilets and the yard, which reduces demand on the city and saves homeowners money. Every home must meet a minimum Energuide 84 rating. That’s an extremely energy efficient home. There are no gas lines. Up to 60 per cent of the heat it needs comes from sunshine streaming in through high quality south-facing windows. Spencer recommends an insulation minimum of R40 walls, R60 for the roof and R30 under the slab. 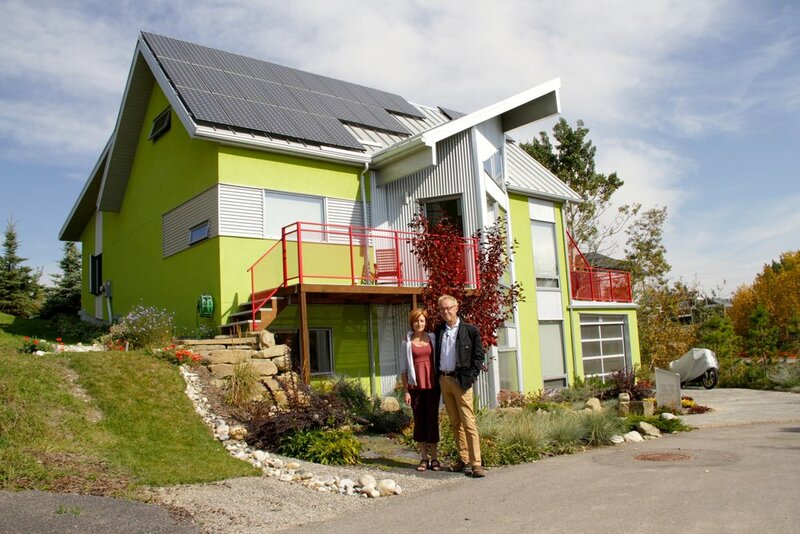 His net-zero house has R60 walls and an R100 roof. Former oil and gas guy turned investment advisor and Financial Post columnist, Martin Pelletier moved into Echohaven in May of 2014 and he loves it. “What made it really attractive to us was the community feel to it, the healthy aspect to it, and the environmental side, the stewardship. We own the land together through a condo association, so what you see here will never change,” says Pelletier. And Echohaven is doing more to build community. They’re planning to build a community greenhouse where everyone who lives in the neighborhood will get their own growing space. This has been a 20-year labour of love for Spencer. And while the project was a lot of work (and, thanks to civic and provincial rules and regulations, a lot harder than it should be), it is nearing its end — and for Spencer it was definitely worth it. “I think it’ll be easier in the future to do it. We’re just kind of a little laboratory, how to do things a little different in the suburbs, creating a more sustainable city environment. I think it’s worthwhile,” he says.